Between winter break, disruption of routines, midterms, state testing, and the weather not always cooperating to allow for recess, this time of year can challenge students’ readiness to learn (and sometimes your patience!). Next time your students (or you!) are feeling a little out of sorts, consider adding an element of play to help. Play is beneficial for many reasons. Not only does it foster healthy brain development, but it also contributes to the social and emotional well-being of children and youth. A brief break in the day, these games can also support the development of Common Core Anchor Standards for collaboration, perseverance and precision. Finally, play can help students focus their energy and be ready to continue with their day. This can be especially effective when adding in an element of mindfulness. Give one of these games a try. We’d love to hear how it goes! Teaching Tip: Write mindfulness activities, test review questions, plays for the big game, or cues for the play on the blocks to use the game as a teaching tool. This game requires attention to fine motor skills as well as decision-making about the best angle from which to approach the bone in order to avoid the tweezers hitting the metal edge. Students may find themselves noticing inner dialogue as they work to keep a steady hand or hear the buzzer sound. This can be an opportunity to share a growth mindset strategy of inserting ‘yet’ at the end of their message to themselves (“I can’t do this” vs. “I can’t do this yet”) and this is, of course, applicable in all facets of their day including math, basketball, and remembering to turn in homework. Teaching Tip: This game can also be used in a biology or math lesson – discuss the actual physical body parts with the students, or have them add up their points (in terms of dollars) for each “operation” they complete. This game of finding matches can be enhanced by inviting students to see what happens when they really look at a card when it is flipped, noticing the details of the image and/or where the card is located in the grid. The practice of mindfulness has been shown to increase working memory and recall, which is a critical skill for academic achievement. 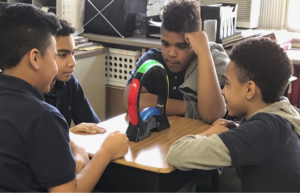 In addition, success in this game requires attention on each student’s individual turn, as well as their friends’ turns. Sustained attention and recall can serve us all well in school and in life. Teaching Tip: Make your own Memory games using vocabulary words, math facts, or stretches the team can do together. This is another game to bring awareness to performing under pressure. The time-keeper dial ticks loudly so this game can invite discussions about staying centered or using strategies for calming oneself in stressful situations. Play the game once, then invite discussion about what students noticed and how this is relevant to performance in other areas of their lives. Then ask the group what they can do to bring more awareness to their actions before playing again. Maybe they notice all of the shapes, feeling them in their hands and outlining the empty spaces on the game board. Or, maybe they work as a team and develop a strategy to solve the puzzle together. Remind students that “Perfection” is the name of a game, not a standard we have to hold ourselves to. Teaching Tip: Playing Perfection can be a fun way to prepare students for timed evaluations or tests. Letting them experience the pressure that we feel when doing things in timed …. Notice what it feels like to do things in a timed situation or under pressure. Build habits early to make them accessible in high pressure situations. With this classic game, students are focusing on the task of making the longest chain possible by dipping the monkeys into the barrel and adding one more, and another, then another. Try a version where they’re talking then compare that to the outcome of working silently. For younger students, they can each have a monkey in hand and work together to make the chain longer and longer as they add their piece one by one. Ask your students if they notice judgement of themselves or their fellow classmates when the chain breaks. Teaching Tip: Students can also use this came to help them practice letting go of ideas or thoughts that they may be holding onto. Build the chain, hold it for a bit, and then realize that letting it go feels much better. There are so many ways to incorporate play into the school day, with students of all ages. Kids learn by doing, and by inviting reflection each time, you encourage present moment awareness – the very core of a mindful practice. 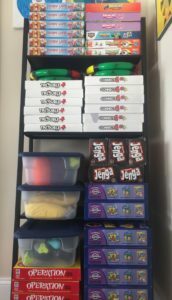 Thanks to Hasbro for donating these games that we incorporate into our ResilientKidsTM classes throughout the year!